Meet Me in London for the Launch of Decorate Workshop! 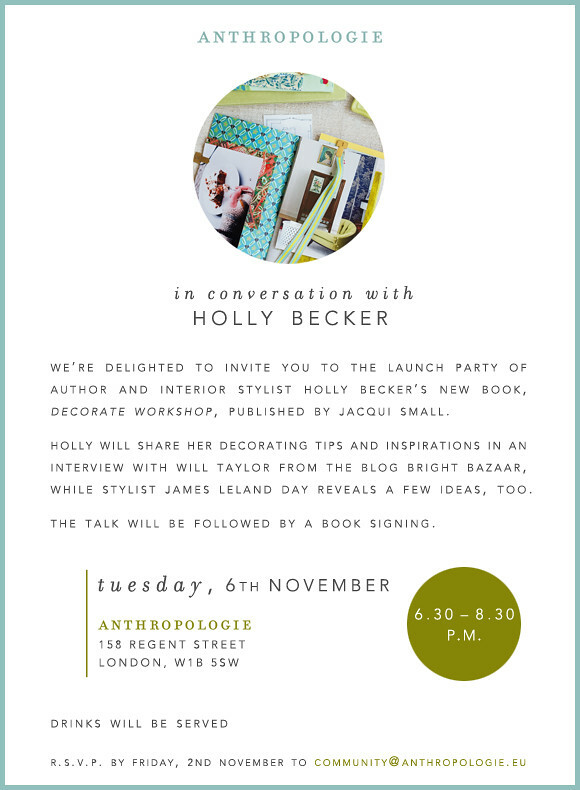 I'm very excited to announce the official launch party for my next book, Decorate Workshop, on Tuesday, November 6th at Anthropologie on Regents Street in London at 6:30 pm. It was difficult finding the right place to launch the book, should I do it on my home soil and launch in America or do something a little closer to my new home in northern Germany? When Anthropologie approached me asking if I'd like to hold my launch at their gorgeous Regents Street store, I had my answer. It would be London. After visiting 20 cities in both America and Europe for Decorate last year, I am not sure I will go on a big tour for this book since the holidays are coming and I am going away on vacation in December, but I may do a US launch for Decorate Workshop in New York City or Boston early next year in January or February. For now, LONDON is where I'll be and I hope we can fill Anthropologie with bloggers and blog readers and have an amazing time together! This event will include two special guests, a dear blogging colleague of mine from London who goes by the alias Bright Bazaar -- the wonderful Will Taylor -- AND an American stylist who once worked for Domino magazine, James Leland Day, who is not only IN Decorate Workshop but will be talking about how to style your home like a pro. Will will be interviewing me, we'll be talking about blogging and books, I'll explain how a book comes to together and how to break into book writing, it's going to be a wonderful event! I'll also answer your decorating, styling, book writing and blogging questions because like most events I do, I am asked questions on every topic and I love to just go with it and cover the spectrum - more fun and everyone gets their answers. 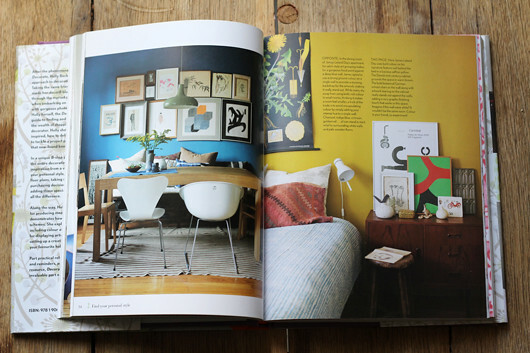 A spread showing James' home in my book. For those of you not able to attend, I hope that you don't feel left out. I'll be tweeting from the event LIVE (follow me @decor8 from 5:30-9:30 that day for pics and updates) plus we have a blog book tour that we're scheduling for the UK, then the US and in February, in Germany, with some of my favorite bloggers, THEN later in November a video coming out about the book AND I'll share photos and fun stuff as I go on the Decorate Workshop board over on Pinterest. That way, everyone is part of the fun somehow!